On the occasion of its 10th anniversary, A. Lange’s first mechanical wristwatch—the Zeitwerk—is revamped with an additional layer of complication. Arguably A. Lange & Söhne’s most iconic model (next to, perhaps, the brand’s eponymous Lange 1), the Zeitwerk has been updated several times since its launch back in 2009. This year, boundaries are further broken with a new manufacture calibre featuring a ring-shaped date display, which showcases the unique Zeitwerk time bridge. While the design of the dial is subsequently elevated, the piece’s overall shape and style remain true to the watch we all know and appreciate. A 44.2mm diameter case, crafted from 18k white gold, is extremely elegant. The steel-grey dial and bold rhodium-plated German silver bridge, meanwhile, contrasts starkly against the red accents of its date display. Wear with a hand-stitched dark brown alligator leather strap, and you’re sure to turn heads. All watches displayed at SIHH are impressive in their own right, but Cartier’s latest Panther-inspired timepiece raises the bar when it comes to form and function. Cartier has spent the last decade securing itself as a major player in the world of haute horology, and the result is in: Révélation d’Une Panthère—a feat of watchmaking ingenuity that can only be described as ‘magic’. Hold the watch upright and over 1,000 diamonds effortless glide across the dial to create the face of a panther. Only briefly does the apparition hold, before the diamonds fall away to the bottom of the dial. So, how does it work? Cartier remains tight-lipped about the techniques behind this astonishing creation, but we do know that the mechanics used are multi-patented and took five years to develop. Widely recognised for being ultra-slim and easy-to-wear, the watchmaker’s hand-wound mechanical calibre 430 MC is used to drive the movement, which is also present in Cartier’s Drive and Santos collections. A passion for invention has long been the driving force behind the co-founders of Greubel Forsey: Robert Greubel and Stephen Forsey, who have spearheaded scientific research and its application to fine watchmaking. And in creating the Balancier Contemporain, a 33-piece limited edition, the brand once again combines technical superiority with exclusivity. Distinguished by its 39.6mm diameter, a first from the brand which has a reputation for building larger timepieces, the Balancier Contemporain’s three-dimensional structure is incredible considering its small size. Not only is it difficult to house a large balance wheel within such a small space, but Greubel Forsey has also had to safeguard the house’s aesthetic codes which, the house claims, meant that the Balancier Contemporain required several years of development. The result? A striking creation, unlike any other, but that’s unmistakably ‘Greubel Forsey’. “I feel the need, the need for speed!” Introducing the most unconventional addition to IWC’s Top Gun collection, the sand-coloured Pilot’s Watch Chronograph ‘Mojave Desert’ (complete with a matching brown dial) is limited to just 500 pieces. There's no doubt that this is a man's watch, thanks to its chunky 44.5mm ceramic and titanium case back. Oh, and don’t forget that rubber strap. Waterproof up to 60m, the model’s mechanical chronograph movement makes this piece a standout among the four-tier line-up that was presented by the brand at this year's SIHH. But what’s the reason for these aviation-themed designs? IWC are celebrating an upcoming expedition of a restored Spitfire, which will fly around the world later this year. Limited to only 250 pieces, the brand has also unveiled the Pilot’s Watch Timezoner Spitfire Edition “The Longest Flight” ref. IW395501, limited to only 250 pieces. The wearer is conveniently able to change the time zone by simply turning the bezel, and there’s also a 24-hour display in the top half of the dial, in addition to the date at 3 o’clock. The link between Hermès and watchmaking goes back over a century when, in 1912, Emile Hermès' daughter Jacqueline was photographed wearing a pocket-watch for which her father had a bespoke strap made. Fast-forward to the 21st century, and the brand continues to express its innovation in various ways, as seen in the Arceau L’Heure De La Lune. This elegant watch features a set of floating dials that hover above two detailed and stationary mother-of-pearl moons. The dials circle the 43mm white gold Arceau case, covering and uncovering the moons to indicate the current phrases in both the southern and northern hemispheres. A pair of lacquer hands show the hours and minutes, while a Hermès calibre H1837 movement is fitted with a module called the ‘L’Heure De La Lune’, which was designed specifically for this creation. The module alone requires over 100 components and, limited to 100 pieces, Arceau L’Heure De La Lune is available in two options: one with a meteorite face and grey lacquered dials and another with a star-filled display and white lacquered discs. 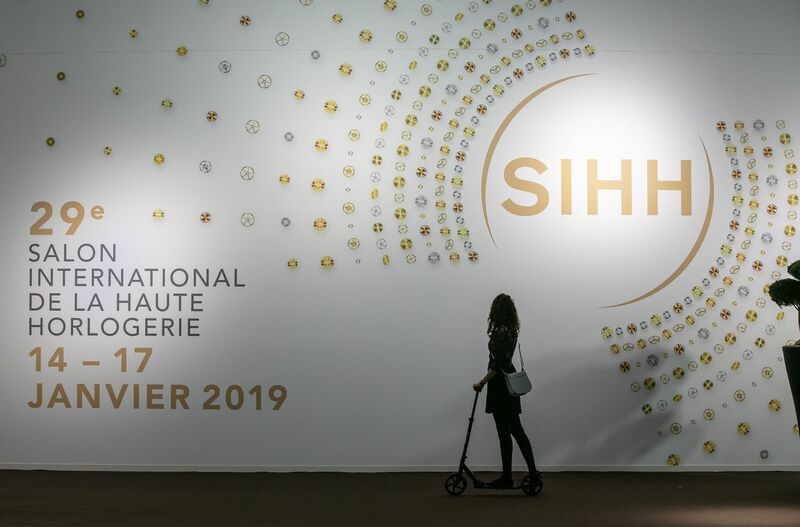 Follow our Instagram stories @sgtatler for more real-time updates from SIHH 2019 in Geneva. This article was first published on hk.asiatatler.com.